Even though I have yet to hear a reaction from my supervisor about the latest topic I’ve proposed for my MRES, over the last couple of days I have been steadily researching pedagogical practices in enterprise education. One article amused me because it fitted so well with my experiences of teaching Business Studies. Basically, the article (Jones & Penaluna, 2013) slams the use of business plans for developing entrepreneurship in students. I’ve read 100s of articles in the last few weeks but since this one tickled my fancy, I tweeted the Australian author, Colin Jones. A bit of an exchange about my research ambitions occurred and we are now aiming to meet over a drink in Brisbane in a few months time. Then his co-author from the UK, Andy Penaluna, also started tweeting me and sending links to great resources for my topic. Colin had probably gone to bed. Andy and I tweeted until I postponed the conversation at 2am. This morning I received more tweets from both of them. How cool is that?! I think I have been following Russel Tarr on Twitter since my first few months of joining, many years ago. He is from England but teaching History at an International School in Toulouse, France. He is a passionate and innovative teacher. 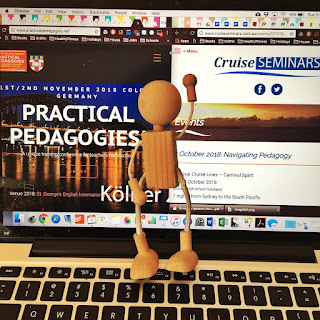 A few years ago he started a conference in Toulouse called Practical Pedagogies but no matter how hard I tried to fit it in to my life and budget I couldn’t go. People have raved about it. Well now I have been accepted to present at this year’s conference which is being held in Cologne, Germany, 1-2 November. I’m hoping to tie-in a visit to Emma who will probably be on university exchange at the time, perhaps in France, perhaps in Taiwan. Now I just have to manipulate credit card points to pay for the flights. I am honoured and privileged to have these opportunities but it’s freaking me out a little. There is a lot happening in October and November this year. 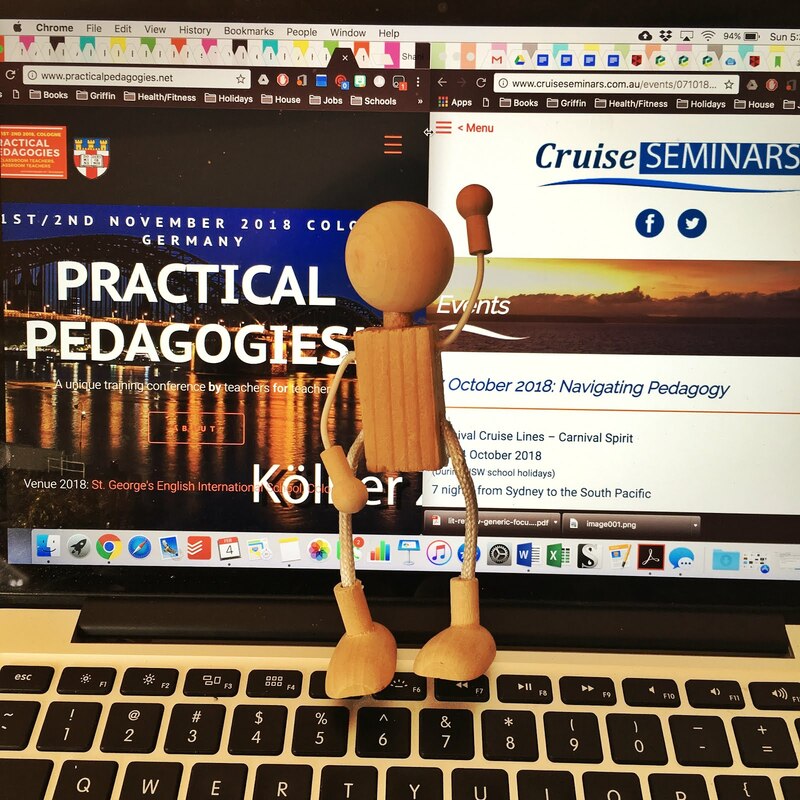 My MRES mini-thesis is due in the middle of a professional development course called Navigating Pedagogy I’m conducting on a cruise to Noumea and New Caledonia (7-14 October). Tough job, but somebody has to do it. Actually, I shouldn’t be so flippant about it. I have already done a lot of hard work to develop the course and be endorsed as a professional development provider by NESA (Board of Studies NSW). As for the MRES dissertation, I’ll just have to submit it early and be prepared for the cruise and the conference super ahead of time. Really, it just means I need to be as organised as I have been the last few months. Easy!